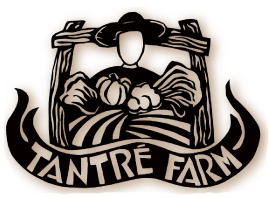 Every year many people come to visit Tantre Farm from all over the area for an opportunity to learn about food, farming, sustainability, ecology, animals, etc. We have hosted Educational Field Trips and Edible Farm Tours for schools, summer camps, Girl Scouts, and many other organizations of all ages throughout all seasons. In order to provide a worthwhile experience, we offer several options that can be tailored to each group ranging from preschoolers, elementary school students, middle school students, high school students, university students to senior citizens. We do not charge most groups for just a walk about the farm. Of course, if a group volunteers on the farm, we always try to include a farm tour. Please call well in advance to schedule these events. Many groups with children like to take a 1-2 hour, edible tour of the farm, but with several fresh, organic samplings along the way. We usually hand out paper lunch-size bags to collect extra, favorite samplings to munch on the way or take home to share with family members. We have many trails around the fields, a bustling packing shed, berry patches, pumpkin patches, a mushroom forest, cows, chickens, wetlands, a kid garden, a sunflower house, an herb garden, and a backyard perfect for picnics with picnic tables, tree swings, a sand box, and some play structures. These tours are completely outside, and with children’s groups, we ask for a sliding scale of $1 to $5 per child. Please schedule in advance by contacting our email address. We offer a more customized experience for schools or other organizations interested in a richer experience that enhances the school curriculum or their group’s goals. Deb Lentz, co-owner of Tantre Farm, is a seasoned teacher of 16 years with classroom experience in 1st through 6th grade. Every season a few of the farm’s 1st year interns or 2nd year apprentices have some teaching or summer camp experience, so we engage their expertise as well. We offer a basic edible farm tour that can be enhanced with more curricular hands-on vocabulary, songs, and activities that fit each groups needs. Teachers should discuss this with Deb a month in advance, if they are interested. Tour content is age-appropriate, and each tour is conducted with an emphasis on good observation skills through the 5 senses and how certain herbs, vegetables, or fruit grow and can be used in cooking. Although tasting is highly encouraged, it is not required. Each group of students comes home with a bag of edible samples and a real life experience of where their food comes from. Some groups end their experience with their own prepackaged lunches on the picnic tables in the backyard. Dress appropriately for the weather and farm conditions, since tours are mostly outside and take place whether raining or sunshine. If inclement weather, we may mutually decide to cancel or postpone the trip. For field trips we suggest a sliding scale of $1 to $5 donation per child for school groups or other organizations requiring more specific attention (teachers and other adults are free).